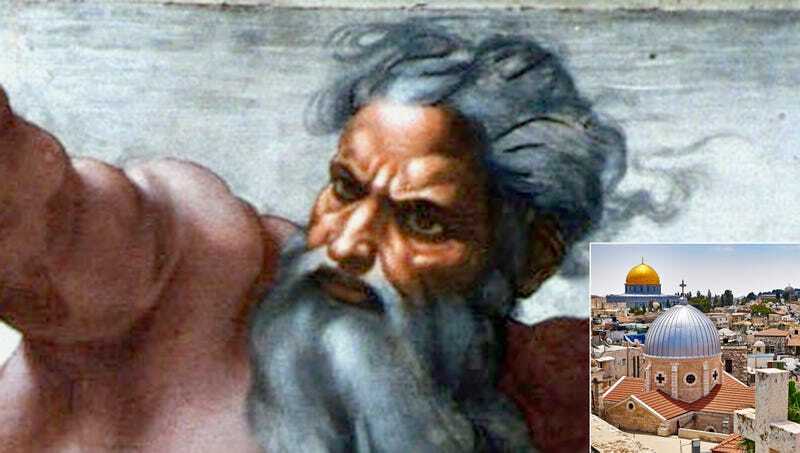 THE HEAVENS—Expressing disbelief of the fuss being made over the Middle Eastern city, our Lord and King of the Heavens, God, reportedly revealed Thursday that Jerusalem was actually only the 87th holiest site on Earth. “It’s not like Jerusalem isn’t sacred, but it’s way less holy than places like Lima, Peru or Cedar Rapids, Iowa,” said our Heavenly Father, adding that the majority of locations on the planet that rank in the top 10 of blessedness have not even been discovered let alone recognized as such, and they possess much more merit as hallowed ground than Jerusalem. “It doesn’t hold a candle to that little village in Siberia where I appeared and hung out doing miracles for a whole week. Honestly, once Jesus left, Jerusalem lost a lot of relevance.” God added that Earth itself was pretty low on the list of sanctified planets the Lord Almighty had created.